Hello again, I'm Heather from Quilts Actually. You can also find me on Facebook. 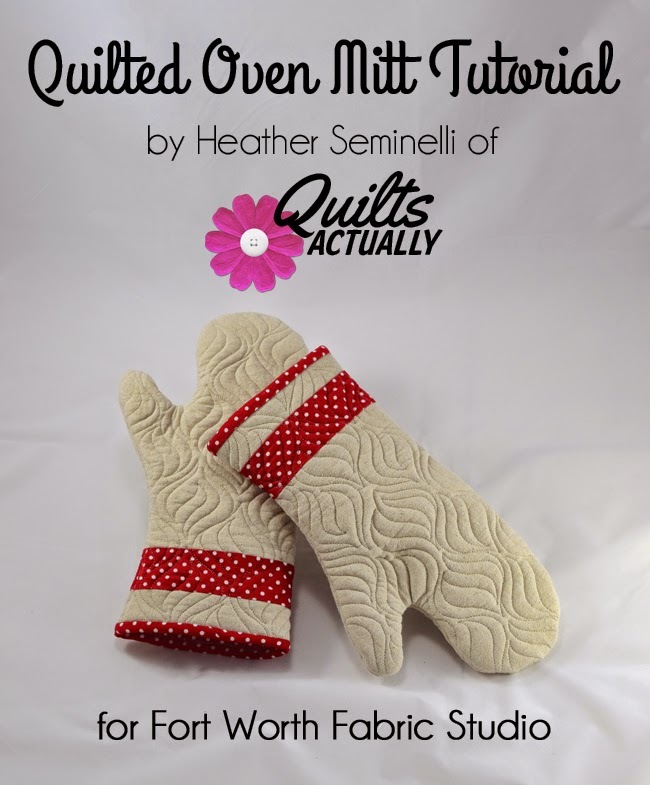 This month I am sharing a tutorial for quilted oven mitts with you. Wash fabric. Once dry, press and square up the pieces. I used the Moda Mochi Solid Unbleached Linen as my top and pieced a 2 inch stripe of Petit Point Red into the linen. To do this, cut a 2 inch strip off the linen along the WOF. Sew the polka dot fabric to the strip of linen and to the main piece of linen. This will be top of your oven mitt. Cut a 2.5 inch strip of the binding fabric along the WOF and set aside for later. 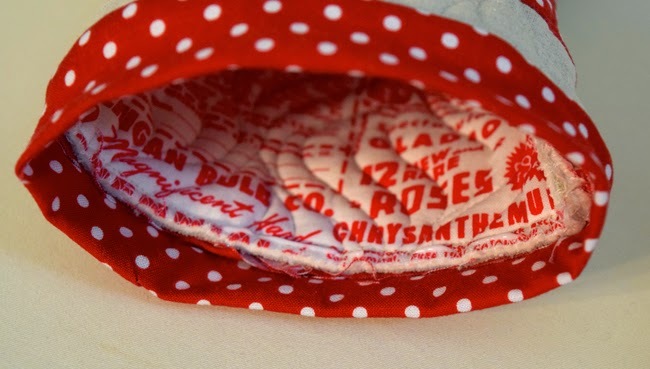 I used Pam Kitty Garden Red on White ads Lakehouse and Petit Point Red for the back/inside of my oven mitt. I had to piece it together because I needed extra backing to attach it to my longarm. 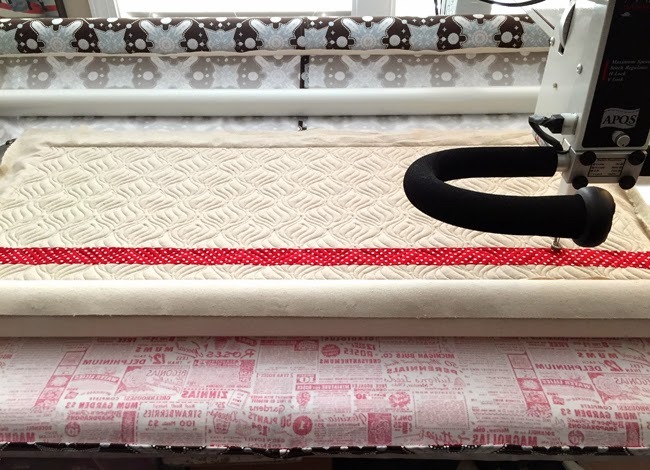 If you are quilting this on your domestic machine, you won't need that extra backing fabric. 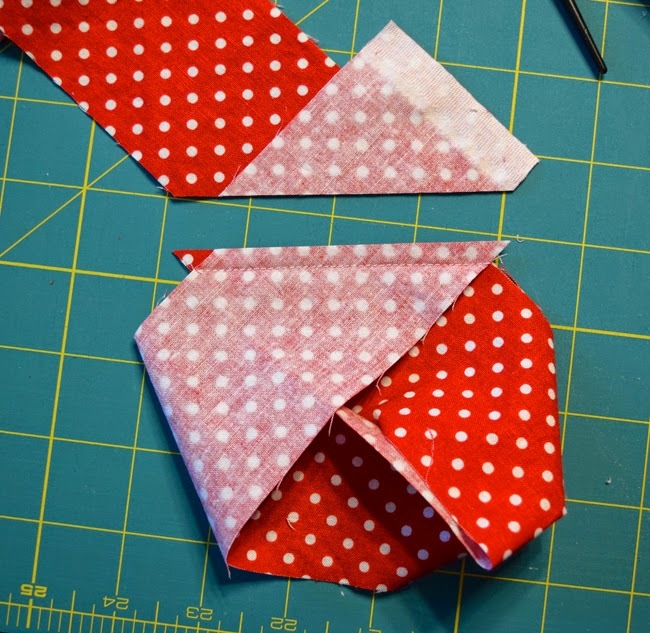 Once you have the front and backed pieced, make them roughly equal in size rectangles. My rectangle ended up being 36" x 14". Next, we create a quilt sandwich. The bottom layer is your backing - the lining for the oven mitts. The right side of the lining needs to be facing down. The next layer is regular batting. The Insul-Bright will be the next layer (with the shinier side facing down). The outer fabric is the final layer with the right side facing up. Baste this sandwich using your favorite method. You can find the FWFS tutorial for basting here. Note about batting: Insul Bright recommends using two layers of normal batting with their product. I have a previous set of oven mitts that only uses one layer. It gets warm if I am trying to hold a pan straight out of the oven more than about 30 seconds. I used two layers of batting in this set and the downside is that this project gets very thick, but does provide a bit more heat resistance. Once this sandwich is basted, it is time to start quilting. The FWFS tutorial for quilting is here. 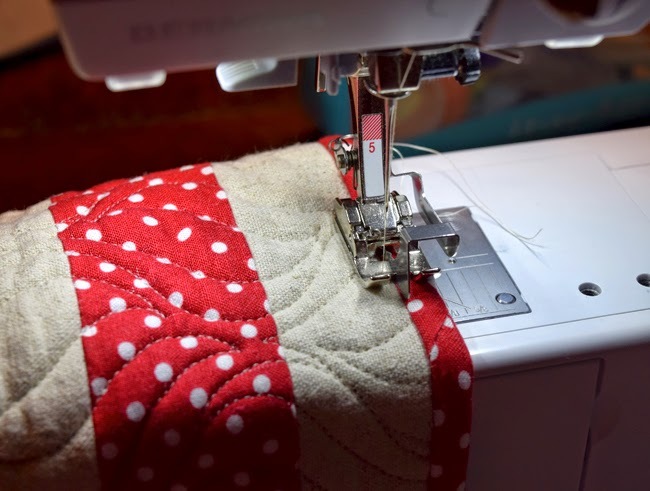 A couple of easy options are to just use straight line quilting or to set your machine up with a large wavy stitch and that is a more decorative version of straight line quilting. 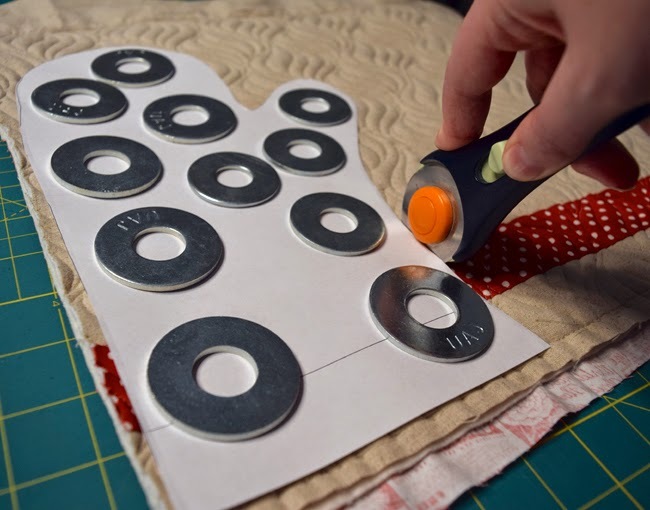 This is also a great way to practice free motion quilting. The sandwich is small enough to move around easily but still get a pretty cool design that you will be able to see daily. Another option to consider is to have it longarmed. It is not very cost effective to send a half yard piece of fabric to be quilted by a longarmer, but if you are sending another quilt in, make the backing about 2/3 yard too big and include the 1/2 yard of fabric you want to use as the outside of the oven mitts. As a longarmer, I am happy to do additional quilting of smaller items with a quilt as long as they are all on the same continuous backing. If you are changing the colors in your kitchen, you can send a backing large enough for placemats, a table runner, and a new set of oven mitts all at once. 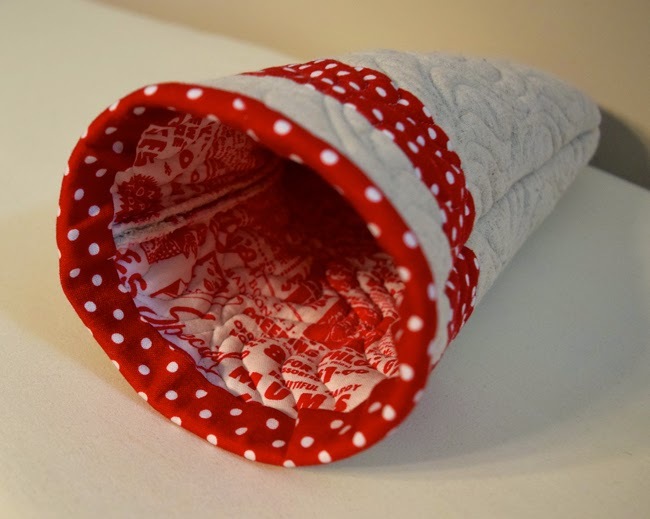 Or, make these for Christmas presents and send a couple yards of Christmas fabric to be quilted. 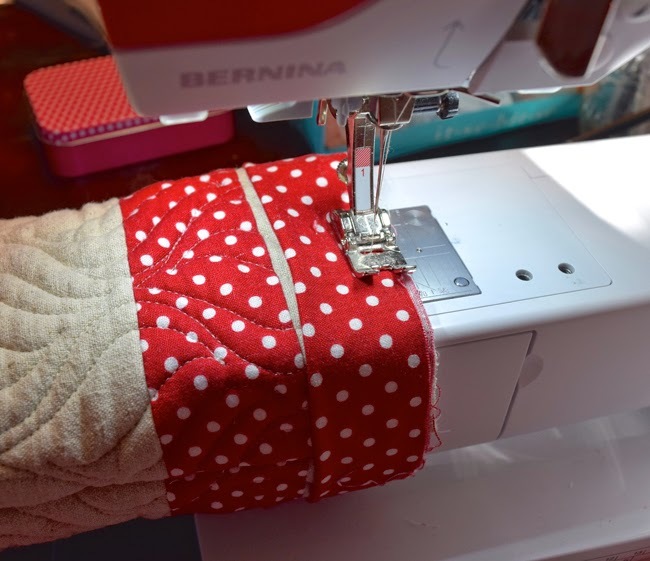 There are multiple ways to make the most out of what you send out to be quilted. Print out the oven mitt pattern at 100% scale. It is two pages, so align the mitt and tape it together. Place it on the quilted sandwich to cut out. If you do the stripe like I did, align the printed dashed line along the bottom of the stripe. Place washers or other patterns weights on the pattern, and cut out. I was able to use my rotary cutter for most of it, but at the inside of the thumb I traced the pattern and used my scissors for that part. 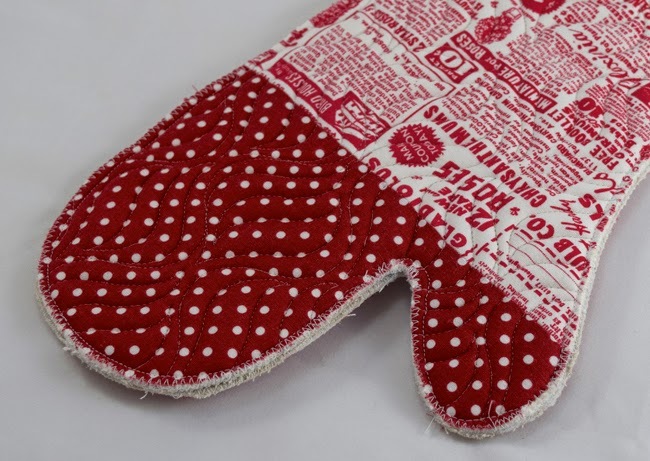 If you want the top of the fabric to be for both sides of the oven mitt, make sure to flip the pattern before cutting out the second side so that you have two mirror images to make one oven mitt. Next, do a zig zag stitch around the entire outline of the oven mitt. Once you finish, turn it over to make sure you caught every bit of the edge of the fabric on both sides. I had a couple areas I had to over twice because I missed them as fabric shifted. This will make this project washable. I used clover clips to hold the two sides together while sewing because this project is thick! Align the two sides of the oven mitt with right sides together. 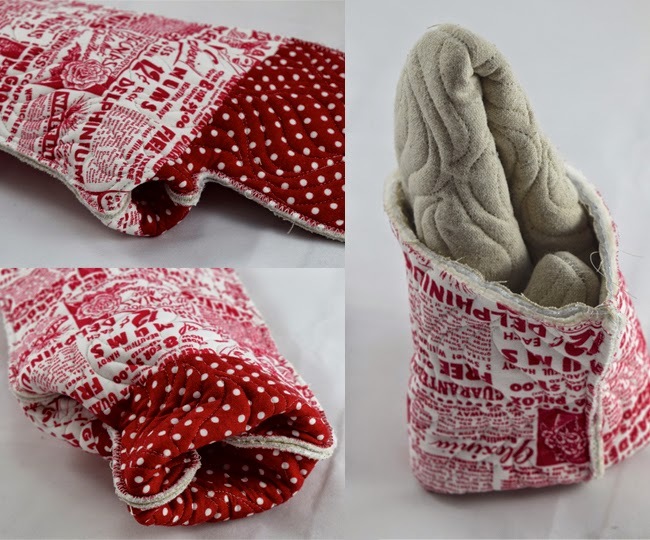 Sew together the oven mitts. There are a lot of layers to sew together, so just take it slow. Use a 1/4 inch seam. If you use a larger seam it will make the thumb extremely difficult to turn inside out later. Make sure to do a reverse stitch to secure both the beginning and end so that it won't start to unravel when it's time to turn the mitt. Once the oven mitt is sewn together, it is time to turn it inside out. Due to the multiple layers, it is thick and not the easiest thing to turn inside out. I found it easiest to start by push the thumb inward first, then starting the top of the hand. Once those are started, it is just a matter of pushing and pulling the rest of the way. Place the 2.5 inch strip of binding with face down around the opening of the oven mitt. Fold one edge up 45 degrees as shown and iron to create a crisp edge. Place a thin line of Elmer's washable school glue along that edge, and then lay the other edge of the binding strip over it. You want the binding strip to be flush against the oven mitt with no gaps because this is how we are attaching the binding to make it the exact size it needs to be. Press where the line of glue is to dry the glue. Carefully remove this ring of binding from your oven mitt. 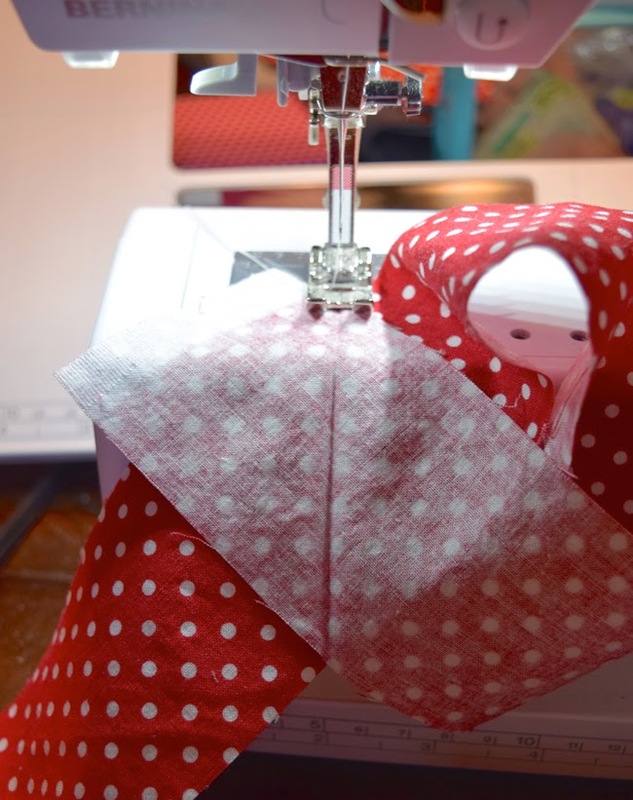 Take it over to your machine and sew exactly on the folded line. Once that is sewn together, cut 1/4 inch away from the seam. It will look twisted, but it needs to be to lay flat on the mitt. Fold the binding in half and place around the opening to the oven mitt, with the edges of the binding lined up with the opening of the oven mitt. Sew together with 1/4 inch seam. Iron the binding upwards. 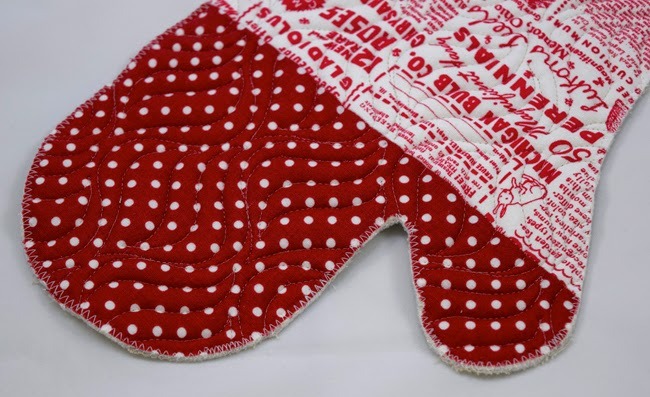 Place a small line of Elmer's washable school glue along the inside edge of the oven mitt. Pull binding down over that line of glue and iron in place. Work your way around the inside edge of the oven mitt, gluing in 2-3 inch sections. Press each section to dry the glue. Once you are done it will look like the picture below. The binding will be held in place by the glue so that you can sew the binding down. The first time you wash your oven mitts, the glue will wash away. Alternately, you could use the clover clips to hold the binding down, but with this small opening it becomes a lot to maneuver to sew. Next, put matching thread in your sewing machine if it isn't already, because I used my stitch in the ditch foot to machine stitch just below the binding all the way around the opening to the oven mitt. The binding will be caught on the inside of the mitt. 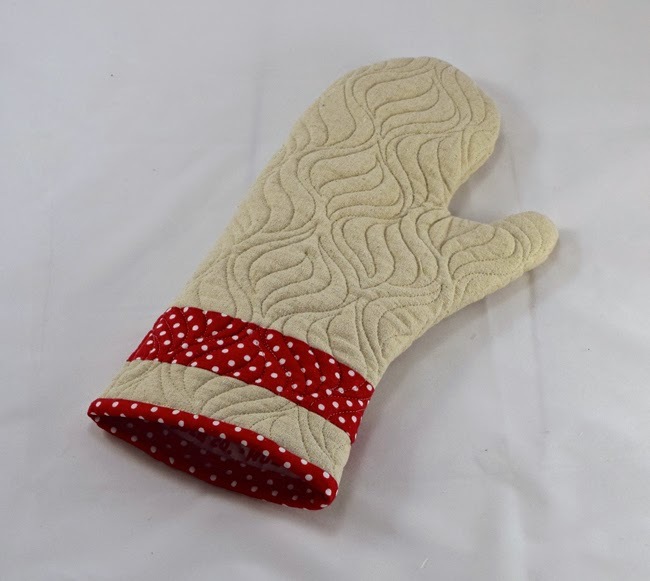 Once you have stitched down the entire way around the oven mitt, you are done with your first oven mitt! 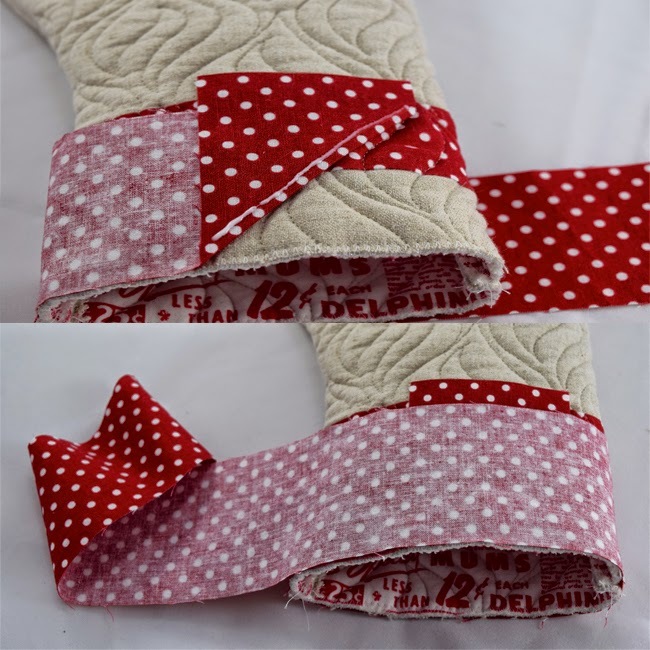 This tutorial gives you enough materials to make 2 oven mitts so that you have a set to use everyday. 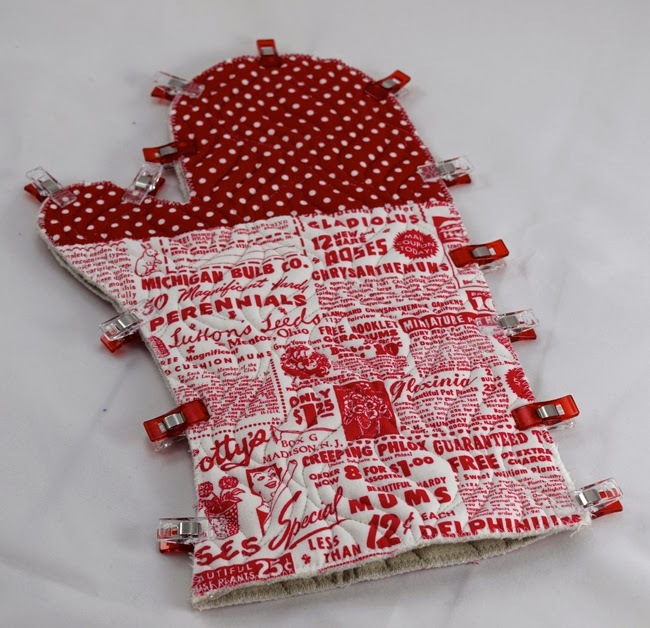 If you make a set of these oven mitts, please share a photo with Lindsey at lindsey@fortworthfabricstudio.com or on Instagram using the hashtag #sewingwithfwfabricstudio. That looks great! It's always handy to have extra oven mitts and hot pads around to grab when you need them. Great idea and wonderful combo in colors. I am going to give it a whirl, minus the long arm portion. BSR and free motion for this Bernina gal.